You all probably know by now that I love Best Buy. Whenever I am looking for electronics, I check out Best Buy first. In fact, after a tragic incident involving our beloved 70" Smart TV, we just bought a new TV from Best Buy 2 weeks ago. We not only got a great price, but great service. The price actually went down a little after we had ordered it. I called and they refunded the difference so we still got the lower price. It was not even a question. I said "The price is lower now. ", they said "We'll take care of it" and processed the refund. Even when I am not actually planning to buy something I love to "shop" at Best Buy and check out all the cool new products, especially the electronics and appliances. My latest obsession? 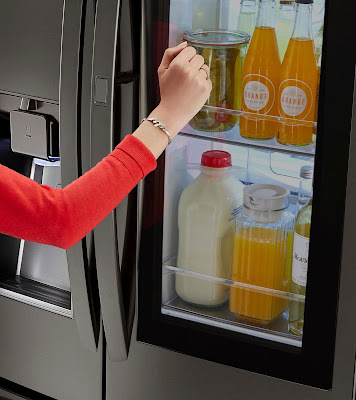 LG InstaView™ Door-in-Door® refrigerators. They are so cool. I know, refrigerators aren't normally the type of product that are #goals worthy, but the InstaView definitely is. At least for me. Maybe because I am a stay at home mom, or maybe because it is just awesome. I think it's the latter. Have you ever told your kids (or hubby or yourself) to close the fridge because they are letting all the cold air out? But you need to see what's inside right? Even if you just looked earlier. You just HAVE to look. Well with the InstaView all you have to do is knock twice to illuminate the contents, allowing you to see inside without letting cold air out. Best knock knock "joke" ever. While you cannot see every item in the fridge this way, the most popular items go in the front (door-in-door section), making them more accessible. That is the part that illuminates, so you see all the most used items with the knock twice feature. Plus the door-in-door feature allows for more usable space. If you do still need to open up to see inside, the ColdSaver™ Panel reduces cold air loss to extend the freshness of food. There are several size and style options available, to ensure you get exactly the storage space your family needs. I love the ones with the double freezer drawers. It's not only the storage capacity, it's the organizational capabilities that makes the InstaView refrigerators so extraordinary. I need all the organization help I can get. Plus all the styles are so sleek and modern looking. There are 3 different colors and multiple sizes and configurations. They are all gorgeous and, better yet, fingerprint resistant. With kids, that is like the holy grail. 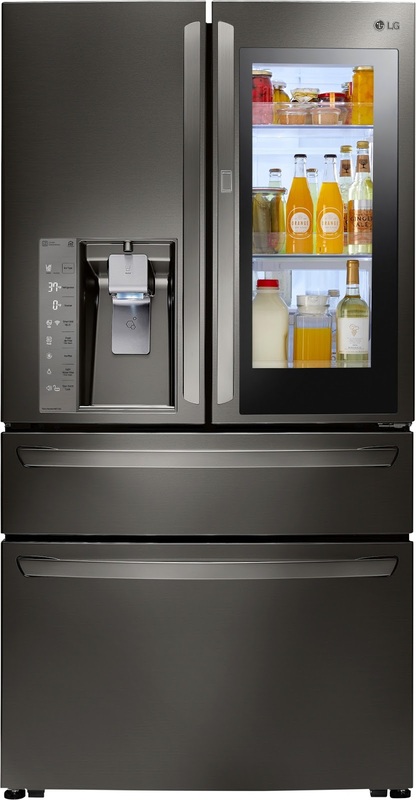 After the TV catastrophe, we cannot afford a new fridge right now (since it's not a need), but I am totally crushing on the InstaView and it will probably be our next splurge purchase. Who needs diamonds? Food is a girl's real best friend, and, naturally, the appliance that keeps it fresh and happy is too. Do any of you have the LG InstaView yet? How much do you love it? I'd love to hear about it. Is anyone planning to buy one soon? Are you just hearing about it? I love to hear everyone's thoughts.